A state trooper blazes along undulating mountain roads after a speeder refuses to pull over. Something is not right. Something is in the air. A series of increasingly bizarre events precipitate the destabilization of the entire region. Phones stop working. Digital signals are lost. An ancient language breathes in the evergreens, soughing through the pines: Asinîya mihkâwa. The rocks are red. Outside of the small town of Red Rock Falls, Sheriff’s Deputy Aletha Pruitt arrives at a farm house. She has Tom Blackburn, a young Native American man, in custody. The Morgan workhorses are kicking up a fuss in the barn. Her FTO, a grizzled cop named Bickford, gets out to investigate a suicide call when something comes rushing around the farm house at him. In the commotion, Blackburn escapes. Until These Voices Quiet features a ensemble of characters, many of them transplants to the region. The Stender family is from New Jersey, as are the two sisters who go missing in the woods after a wedding goes drastically wrong, and a drunken groom skulks off into the night. What is happening? Each of our heroes – the young, unstable Raymond Stender, the rookie deputy Aletha and a host of others carry restless demons. Has something come to collect the markers of their pasts? Is it something more, too? Something to do with Blackburn’s father, who, a transplant himself, once boarded at the old farm house? It’s this very farm house where these people find themselves converging… fighting to stay alive. 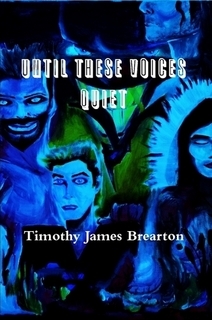 Until These Voices Quiet is a twisting, turning adventure in a post-apocalyptic atmosphere. Think you know what’s going on? Think again – the story moves ever onward, unveiling the histories of the heroes one chapter at a time, uncovering the source of the spell which grips them all one whisper at a time. Asinîya mihkâwa. The rocks are red. Indeed they are, and more blood will spill before the nightmare is over. check out more at the new site – BREARTON BOOKS ! Until These Voices Quiet starts with a bang. A state trooper blazes along undulating mountain roads after a speeder refuses to pull over. Something is not right. Something is in the air. A series of increasingly bizarre events precipitate the destabilization of the entire region. Phones stop working. Digital signals are lost. An ancient language breathes in the evergreens, soughing through the pines: Asinîya mihkâwa. The rocks are red. Outside of the small town of Red Rock Falls, Sheriff’s Deputy Aletha Pruitt arrives at a farm house. She has Tom Blackburn, a young Native American man, in custody. The Morgan workhorses are kicking up a fuss in the barn. Her FTO, a grisled cop named Bickford, gets out to investigate a suicide call when something comes rushing around the farm house at him. In the commotion, Blackburn escapes. Until These Voices Quiet features a group of characters, many of them transplants to the region. The Stender family is from New Jersey, as are the two sisters who go missing in the woods after a wedding goes drastically wrong, and a drunken groom skulks off into the night. What is happening? Each of our heroes – the young, unstable Raymond Stender, the rookie deputy Aletha and a host of others carry restless demons. Has something come to collect the markers of their pasts? Is it something more, too? Something to do with Blackburn’s father, who, a transplant himself, once boarded at the old farm house where these people find themselves converging, fighting to stay alive? Until These Voices Quiet is a twisting, turning adventure in a post-apocalyptic atmosphere. Think you know what’s going on? Think again – the story moves ever onward, unveiling the histories of the heroes one chapter at a time, uncovering the source of the spell which grips them all one whisper at a time. Asinîya mihkâwa. The rocks are red. Indeed they are, and more blood will spill before the nightmare is over. In order to understand what is happening around them, each hero must understand what is happening within themselves. Ride The Divide, the award-winning feature-length documentary about the world’s toughest mountain bike race, will make a stop in the north country on Sunday, October 24 at the Palace Theater in Lake Placid. The film chronicles the story of several mountain bikers who attempt the 2,711-mile race named the Tour Divide along the Continental Divide in the Rocky Mountains. The movie was named the Best Adventure Film at this year’s Vail Film Festival. Ride The Divide embraces the inspiring stories of three of the racers who experience the immense mountain beauty and small-town culture as they attempt to pedal from Banff, Canada, to a small, dusty crossing on the Mexican border. There’s Mike (pictured above), a 40-year-old family man who uses this challenge to chart a new course in life; Matthew, a leader in extreme endurance racing who’s competing for his fifth time; and Mary, the ﬁrst female rider to race this route. As they set out, they will attempt to accomplish what very few have been able to. Over the course of a few weeks, they’ll attempt to climb over 200,000 vertical feet along the backbone of the Rocky Mountains. 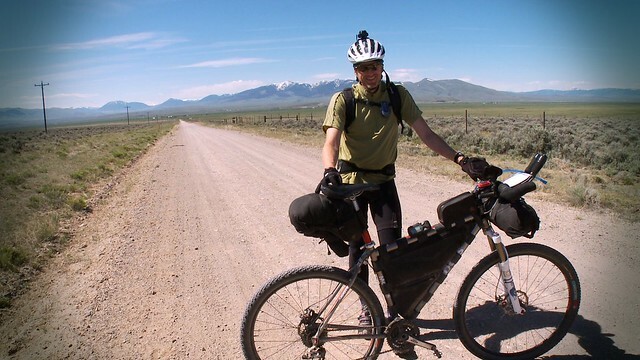 Ride The Divide will be shown Sunday, October 24th, 7:30 p.m. at the Palace in Lake Placid. Tickets are $10 at the door. This event is presented by the Adirondack Film Society, hosts of the annual Lake Placid Film Forum, and sponsored by High Peaks Cyclery and Placid Planet. i believe that imagination is the passport that we create to help take us into the real world. i believe that imagination is another phrase for what is most uniquely us. jung says, “the greatest sin is to be unconscious.” holden (caulfield) says, “what scares me is the other guy’s face. it wouldn’t be so bad if you both could be blindfolded.” most of the time the faces that we face are not the other guy’s, but our own faces. and it is the worst kind of yellowness to be so scared of yourself that you put blindfolds on rather than deal with yourself. to face ourselves. that’s the hard thing. the imagination – that’s God’s gift. to make the act of self-examination bearable. This entry was posted in books, movies, Uncategorized. Bookmark the permalink.